Applications are invited from suitably qualified candidates for admission into the following Full Time and Part Time programmes in Imo State Polytechnic, Umuagwo, Owerri, IMO STATE for 2018/2019 Academic Year. Imo State Polytechnic HND (Regular 1) Programmes. Imo State Polytechnic HND (Regular 2) Programmes. Imo State Polytechnic HND (Weekend) Programmes. 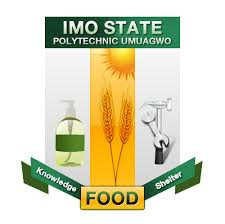 Imo State Polytechnic HND – Admission Requirements. i. Must have ND in Relevant courses. iv. JAMB score printout during the ND level admission. Imo State Polytechnic HND Admission – Method of Application.